"The year, verily, is Prajapati and there are two paths thereof; the Southern and the Northern. Those who perform sacrifices and engage in pious actions, as duties to be done, win only the World of the Moon; verily they return hither again. Therefore the sages who desire off-spring travel by the Southern Path. This path of the Fathers is rayi, food. But those who seek the Self through austerity, chastity, faith and knowledge travel by the Northern Path and win the Sun. The Sun, verily, is the support of all lives. He is immortal and fearless; he is the final goal. Thence they do not return." "Without going outside, you may know the whole world. Without looking through the window, you may see the ways of heaven. The farther you go, the less you know. Thus the sage knows without travelling; He sees without looking; He works without doing." We said that in the sign of Sagittarius streams flow into rivers and seas, thought-forms give life to eggregore, thoughts and observations on the world arrange themselves in a philosophical system; a thousand little causes determine a great effect. Capricorn is the symbol of the ultimate goal to which everything aims, of the top craved by the climber and the ambitious man; the symbol of the abyss at the base of which all that tends towards the bottom accumulates. This is why the top part of a Capricorn is a goat and the bottom part is a fish. Capricorn owns the awareness of the deep meaning of the hermetic saying: "what is above is below", not only because a polarity cannot exist without the other, but also because in Capricorn there is no conflict between the practical nature and the abandoning to instinct and the ascetic practice, spirituality and materialism, detachment and attachment, inexperience of youth and experience of old age, birth and death, health and disease; indeed all this appears as a quality of the Self, as epiphenomenon generated by the friction with the world, whilst here we are dealing with the Self, which is beyond these particular determinations, these qualities. Each individual, as we have said, bends and distorts the universal directions that make the subtle weft which the universe is woven with, according to his own needs. In Capricorn these directions show themselves to those who can and want to recognize them, in their weft. To those who carried out a journey of knowledge the "individual directions" appear for what they are: the attempts and imitations of a trained monkey. After the dismemberment we described in the sign of Scorpio, undergone by the energies of those who followed a profane journey, each portion of energy reaches in Capricorn the "outside soul" that was destined to it. This is how the process of corruption ends and the process of generation begins. Let’s now examine the alchemic stage described in the two bas reliefs of the Capricorn. In the top one, in Notre Dame there is a seated woman who carries in the scroll an animal which is a hybrid between a cockerel and a fox. 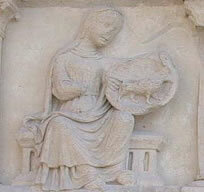 In Amiens a seated woman carries in the scroll a lamb and in Chartres the woman carries the emblem of a wild boar. 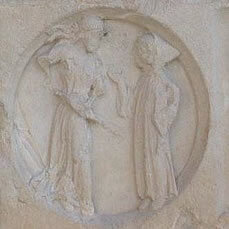 In the bottom bas relief, in Notre Dame a woman kicks away a page . In Amiens the woman kicks the page away whilst rejecting with a hand his offer of a ciborium with a lid. 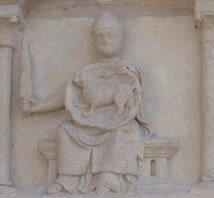 Finally in Chartres , the bas relief is damaged. Fulcanelli identifies in the Cockerel-Fox one of the most advanced stages of the cooking of the compost, that stage of blending between fixed and volatile, between sulfur and mercury, which ends with the fixation of the philosopher’s sulfur. The cockerel, which announces the beginning of the day, is also sacred to Mercury. 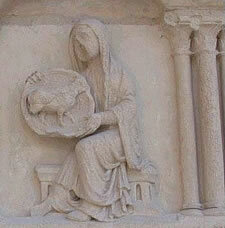 The Lamb is a symbol of the birth of the Philosophical Baby, reminding us that for the alchemists the Stone was associated with the Christ: "Ecce Agnus Dei, ecce qui tollit peccata mundi". Here we see the manifestation of the healing power of the Stone on external evils. The wild boar, untamed and unfriendly animal, seems to have a closer relationship with the spiritual condition described in the bas relief of the woman who kicks away the page. Fulcanelli lapses into a long digression, disputing with the alchemist Sabine Stuart De Chevalier and it is not clear if he rejects the operation described by the bottom bas relief as "non pertinent". If the page represents Mercury, as it appears, it must be meant as vulgar mercury, whose gift at this stage must be rejected by the adept. Therefore it is a reference to the hermetic closing of the vase, sealed for the success of the Work at least until the next zodiac sign. On the topic of the hexagram "The Dissolution", the ancient Chinese book of Ching says in one of the moving lines: "He breaks free from his ranks. Sublime health! Through dissolution accumulation follows. This is something that ordinary people don’t think about". Well, "to reject the gifts of the vulgar mercury" means also to carry out the supreme renunciation, refuse to have an interpretative mental image of the world and wait humbly for the light to advance inside us. If we want to reach Anima mundi, the subtle essence of things, we must give up even the mind. "Within my heart, all forms may find a place. The cloisters of the monk, the idol’s fane, A pasture for gazelles, the Sacred house of God, to which all Muslims turn their face: the tables of the Jewish Law, the Word of God, revealed unto His prophet true. Love is the faith I hold, and whereso’er his camels turn, the one true faith is there." "What to do, then, Muslims, that I do not know myself? I am not Jew, not Christian, not Zoroastrian not Muslim. I am not from the East, from the West, from earth, sea, land or sky. Not of Earth, not of Water, not of Wind, not of Fire, not of Empyrean, not of Throne, not of Being or Essence. Not of India, not of China, not of Saxony or Bulgaria, not Persia or Babylon, not of Korashan. Not of this world, not of the other, not of Hell or Heaven. Not of Adam, not of Eve, not of ethereal gardens. My place is beyond space, my sign is no sign, not soul, not body: I am only of the Loved one. I got rid of any dualism, of the two worlds I only see one. I look for one, I know one, I sing one, I contemplate one. He is the Ultimate, he is the First, he is the Inner, he is the Outer." The Sign of Aquarius, like for Leo, is characterized by the power to irradiate energy. In this instance, though, it is not the inner Sun that irradiates it, but Saturn, a cold and far away planet, connected to the element lead. The challenge of the alchemist, as everybody knows, is to turn lead into gold. We could consider it as a metaphor of the animation and reawakening of Saturn, connected to the bones, sleep and dream, the Double, detachment and death, to the reduction of everything to its essence. Without an inner work Saturn is destined to undergo the fate of Osiris’s body, dismembered by Seth, and Dionysus , torn apart by the Titans. The journey of awareness that we outlined so far with the metaphor of following a sunray in its journey through the twelve signs of the zodiac is similar to the work of Isis, that gathers all over Egypt the pieces in which Seth dismembered his brother Osiris; he rejoins them in a unity, reawakening him from his sleep of death. When all thought-forms reached the eggregore they were destined to, when the individual activity compared itself to the collective and world activity, the man unaware of himself will be ripped apart by the individual forces he related to. Indeed every eggregore (let’s think of the "profane" eggregore that accompany religious and political sects) using the thought-forms that connect it to the individuals, uses men as unconscious instruments to realize the goals that characterize it. Since we’ve mentioned Dawkins, we might highlight the fact that eggregore, thought-forms and the Soul of the world are invisible entities and, in a way, conceptual abstractions, "ghosts" with which science will never deal, because they cannot be observed, reproduced and falsified. Eggregore and thought-forms are only ideas; they can become concrete entities only after some work on oneself. For this reason, in the negative sense the sign of Aquarius is connected to applied ideology without keeping into consideration other people’s context and feelings, to being dominated by a "vision" and imposing it to the world without critical sense. On the other hand, the man who managed, in Capricorn, to establish a relation with the Soul of the world, the man who put himself consciously at the service of super-individual forces, of his own Self, will become a farmer destined to spread on earth the seeds of the Future. He will be able to contemplate the energetic spectrum of phenomena, events, people and objects beyond visible, to grasp the subtle aspects of reality and even to intervene on them. To activate, animate and reawaken Saturn means to help this midnight Sun to hand its gifts out, re-projecting on the world the reflection and the sound of the Soul in the world. In the highest sense Aquarius is therefore associated with the idea of universal Brotherhood, with the ability to find in everyone the spark of the Spirit beyond the differences of census, race, religion, ideas, and position in the world. In alchemy the stage that corresponds to this zodiac sign seems to be the Projection; the alchemist can finally open his Vase, kept so far hermetically closed, and use the Stone (or the dust gained from it) to transform the world, to heal diseases; he can use the power of the Stone to perceive these aspects of the world that are invisible to profane eyes. Let’s now talk about the bas reliefs in the gothic cathedrals. In Notre Dame and Amiens (in the cathedral of Chartres unfortunately the bas relief is too damaged to interpret it) in the top bas relief there is the representation of a woman carrying a scroll with a bull on it. In the bottom one the three cathedrals have the same image: a man and a woman face each other; the man holds a book in a hand and he seems to illustrate its content; the woman holds a sword in her hand pointing to the man. As far as the top bas relief is concerned, Fulcanelli tells us that the Bull expresses the definitive stabilization of the philosopher’s sulfur. The Work is also described as salvation and liberation of the light of the Divine Knowledge imprisoned in the matter, as rediscovery of a Lost Word or a secret name or a forgotten language, which gives power on all things to those who know it. On this topic, alchemists often appeal to the so-called phonetic cabbala or "language of birds", consisting of hiding an arcane or an alchemic secret behind the origin of a name or in the sound of a word, or in the double entendre of an obscene joke. 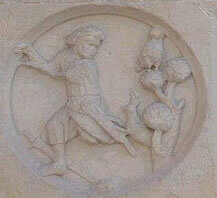 Another image that often recurs is that of the "Celestial Agriculture", consisting of sowing and gathering fruits from the trees of the Sun, of the Moon and of the other planets. Finally, let’s remember the close analogy that the builders of cathedrals in the Middle Ages, the confraternities of free masons (ancestors of modern freemasonry) established between the accomplishment of the Alchemic Work and the building of a Temple on earth that was built in the likeness of the Celestial Jerusalem. The Temple (usually dedicated to the Virgin Mary) had the same paradoxical characteristics of the alchemists’ stone, which is to corporify, to translate into live experience subjected to the action of time what was invisible and immaterial. Simultaneously a similar temple, once built, was supposed to become the threshold and the vehicle to lead men towards invisible and immaterial, immutable and eternal. In the bottom bas relief the sword, as it often happens in alchemy, represents the secret fire of the alchemist, who can finally be projected to the outside, showing us the true essence of the world. The book is the book of Nature  which, from this moment on, reveals all its best hidden secrets to the alchemist. "Whoever believes in me does not believe in me only, but in the one who sent me. The one who looks at me is seeing the one who sent me. I have come into the world as a light, so that no one who believes in me should stay in darkness"
"Then God said, "Let us make mankind in our image, in our likeness, so that they may rule over the fish in the sea and the birds in the sky, over the livestock and all the wild animals, and over all the creatures that move along the ground. So God created mankind in his own image, in the image of God he created them; male and female he created them." "You know that those who are regarded as rulers of the Gentiles lord it over them, and their high officials exercise authority over them. Not so with you. Instead, whoever wants to become great among you must be your servant, and whoever wants to be first must be slave of all. For even the Son of Man did not come to be served, but to serve and to give his life as a ransom for many." "A farmer went out to sow his seed. As he was scattering the seed, some fell along the path; it was trampled on, and the birds ate it up. Some fell on rocky ground, and when it came up, the plants withered because they had no moisture. Other seed fell among thorns, which grew up with it and choked the plants. Still other seed fell on good soil. It came up and yielded a crop, a hundred times more than was sown." When he said this he called out "Whoever has ears to hear, let them hear." In the sign of Aquarius the "black Sun", Saturn, irradiates towards the world the seeds of the Future; the wheel of the Karma shows the inexorable law of cause and effect to those who can recognize it. In Scorpio, Sagittarius and Aquarius the thought-forms join the eggregore that correspond to them and individual actions mix up with collective ones, determining macroscopic effects, just like during an election an individual vote contributes, together with thousands more, to elect a member of parliament. In the sign of Pisces those effects, the energies freed in the sign of Aquarius, head again towards every individual being, reaching him depending on his peculiar features and characteristics. For this reason the two fishes that represent the glyph of the sign, going to opposite directions, show an oscillation between individual and collective dimension, between I and Self, sacred and profane, holiness and vice. In this instance as well we must distinguish between two instances. First when the journey of the zodiac has been carried out by an unconscious traveler; second when between Cancer and Leo the "artifice" we mentioned has been set up and the travel is therefore conscious. However, the sign of Pisces will characterize the messengers of infinite and invisible and their qualities will be mediumism, serving the others in the highest sense (in the sense of perceiving other people’s destiny and carrying it on one’s shoulders), mysticism, spirit of sacrifice, but also passiveness, vice, sloth and folly. Indeed, the messages that come from the Unconscious or from the super-personal world of the eggregore can generate great confusion between the I and the Self, a delusion of grandeur and hypertrophy of the I, up to destroying the psyche that is not ready to assimilate its content. To those who carried out the journey in a state of consciousness, as we said, the sign of Pisces shows how to carry the gifts gathered in the sign of Aquarius in the world, how to distribute them; it is the sign where we can clearly see the discipline of action, the path to conjugate one’s own individual desires with the cosmic laws, one’s own will with the service for the others. In Christianity the sign of Pisces belongs to saints; in Hinduism it characterizes Avatars, the conscious souls derived from the Wheel of existence that come back down here voluntarily, sacrificing themselves to bring the light in the lowest levels of existence. (Krishna, Buddha, Christ and Mohamed are considered Avatars; the first Christians used the fish as symbol of the Christ, also because the Greek word that designated it, ίχθύς, was the acrostic of Iesous Christos Theou Yios Soter, Jesus Christ Son of God the Savior). In alchemy the operation of projection that started in Aquarius with the opening of the vase is concluded and the alchemist chooses his own goals, not arbitrarily but impersonally; the voice of Self, that he now knows and can listen to, indicates them to him. Prophets and clairvoyants draw inspiration from that same voice but also, as we said, mad people, who are nor prophets neither clairvoyants, but mixed up the voice of the Self with the voice of the I. In this sign the archetype of the Force, Boaz, the second pillar of the temple of Solomon is completely achieved. Indeed, the true strength is not the power to impose one’s will, the physical strength, to be able to rely on a strong charisma or a favorable social position. The true strength is harmonizing one’s own individual life, one’s aspirations and actions with the cosmic laws; it means being able to listen to the subtle voice of the Self. "Man wants what happens to him and what happens is what he wants". No fear, no obstacle, no suffering or death can affect who has this kind of strength. Finally we must notice that this mysterious strength is not obtainable as an individual conquest, but it is given in Aquarius by the emanations of the Anima Mundi of which we are only bearers in the sign of Pisces. Therefore it is natural to associate it with the Lost Word, with the gift of languages and the descent of the Spirit mentioned in the Pentecost, with a newly-found universal power of language. 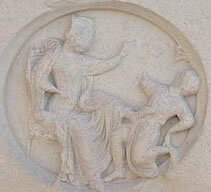 Let’s now examine the bas reliefs corresponding to the sign of Pisces. In the three cathedrals of Notre Dame, Amiens and Chartres, in the top bas relief we can see a seated warrior holding a sword in one hand and a scroll with the symbol of a lion in the other. In the top bas relief, on the right there is a treble tree and an owl rests on one of the branches. On the left a man runs away dropping the sword and turning back towards the tree. At the feet of the tree a hare  seems to chase him . In the top bas relief the Lion represents the strength that the alchemist gained by applying the fire (the sword) correctly to the Work. He achieved the Work on the red and he can now use the redeeming properties of the Philosopher’s Stone; he redeemed the Spirit from the brute matter that imprisoned it and gave it a "glorious body" worthy of its splendor. In the bottom bas relief the treble tree from which man runs away might symbolize the tree of knowledge of Good and Evil, or the Tree of Life, or both. If we interpret the subdivision in three parts as vertical, the three bushes represent the three levels of existence: the underworld, the world of "ordinary" perception and the world connected to the subtle levels of the being. If we interpret it in a horizontal sense, it will express the fictitious division that we work between inside and outside of man and the intellect that measures them. The owl perched on the middle branch is a mercurial animal, able to "see in the dark", and it expresses the ability gained by the alchemist to see all the three levels that we indicated as parts of himself. The alchemist drops the sword on the ground, obvious sign that the Work is finished and the fire has done its duty, but also of the fact that the fire can now be re-projected on the world, on the matter. The hare is also a mercurial animal, here it might represent the vulgar mercury from which the alchemist now runs away; once achieved the Work he must "go out of the world", abandoning forever his name and his profane identity, whatever their relevance, finally heading towards his own initiatory destiny. We would like to highlight an oddity. As it is well known alchemists often used the "phonetic cabbala" to indicate matters, sentences and secrets of their Work. Well, the bottom bas relief might be seen also as an indication derived from homophony or as a "riddle". Indeed, in archaic French owl and hare, chouette et lievre, was also said choute et lievre, which sounded like chute est l’Oeuvre, viz. "the Work is finished". On the contrary, if we interpret the bas relief as a riddle and we highlight the fact that the owl is represented precisely above the hare, we would say chute sur lievre, which, by homophony, will result as chut sur l’Oeuvre, viz. "keep quiet on the Work".